Give wood floors like-new luster with the proper polish and technique. Think about the beating your wood floors endure on a daily basis: high heels, pet nails, children’s toys, and shifting furniture, to name a few! Tough as wood floors may be, their finish is still susceptible to scratches and scuffs. Refinishing—the process of sanding floors down entirely to apply a new surface finish—is costly and really only necessary every few decades. 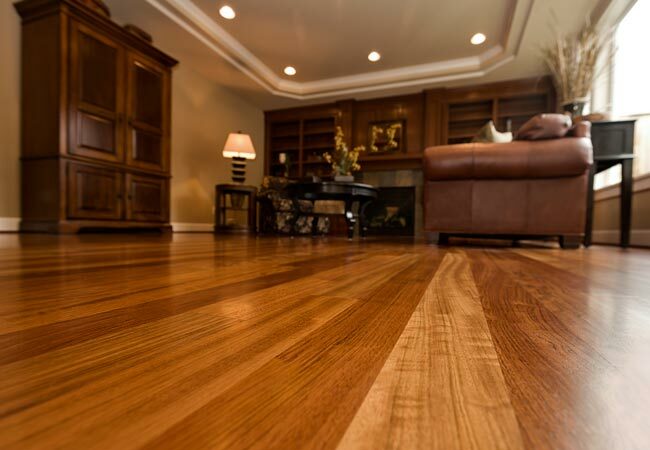 But polishing with a product specifically formulated for your floors is an easy, inexpensive way to regain shine, even out imperfections, and extend the life of your handsome hardwood. All it takes is a flat-head mop with a microfiber cleaning pad and commercial wood floor polish, like that from Bona, which comes in low- or high-gloss sheens to achieve your desired look. Whether or not you should polish your floors, however, depends on their finish. Those with a protective surface—a waterproof barrier such as urethane, for example—will benefit from polish, but floors with penetrating finishes like tung oil or unsealed wood require wax instead of polish. Using the wrong product can cause a host of problems, from making floors too slick to dulling the finish, and impair proper refinishing down the road. So it’s important to determine which kind of floor you have (our Step 1 in this guide on how to polish wood floors) before you dive in and cause damage. STEP 1: Test the finish on your wood floors. If you’re unsure what type of finish is on your floor, scrape off a tiny bit from an inconspicuous area with a sharp knife blade. • If the finish is smudged but no clear material is scraped up, your floor probably has a penetrating finish. Stop here, and do not polish these wood floors; these should only be waxed. • If you see a clear material, your flooring likely has a surface finish and it’s safe to polish these wood floors. Still, be sure to test out the polish in a small hidden or inconspicuous location on the wood before tackling the entire floor. STEP 2: Clear and clean your wood floors of dust and dirt. Empty the room, removing as much furniture as possible, then clean the floor thoroughly to remove dust and dirt. Sweep or vacuum, then mop with a commercial wood floor cleaner or solution of a quarter-cup of dish soap and a gallon of warm water to lift any lingering grime. Give the floors a final pass with a clean, water-dampened mop to remove any cleaner residue. Dry completely with a soft, clean towel. STEP 3: Polish wood floors to a shine. Begin in a back corner of the room, plotting a path that will have you end up near an exit, pour a small S-shaped amount of wood floor polish onto the floor. Using a flat-surface mop, work the solution back and forth in the direction of the wood grain, smoothing out any air bubbles. Work in small areas (about three to five feet wide in either direction) to best control the amount of polish you’ve applied. While you must make sure to completely coat the floor, thin layers will dry more rapidly than thick ones, and you can always apply another coat if needed. Note: Polish can stain drywall and baseboards, so avoid splashing on these areas. STEP 4: Hold off restoring the room for at least a day. 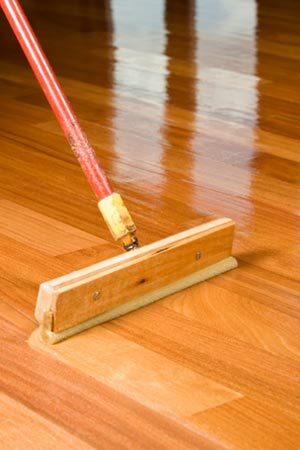 STEP 5: Follow a few precautions to keep wood floors looking great, and you can put off your next polishing job! Now that your floors look like new, maintain them by placing rugs at entry doors to prevent dirt from being tracked inside. If your kitchen has wood flooring, also place a rug at the sink to catch stray drops of water. Stick to a regular cleaning routine, vacuuming weekly and giving the floors a deep clean monthly. Skip any homemade cleaning solutions that include diluted vinegar or ammonia on wood floors—all they’ll do is dull a surface-finished floor. Instead, for a better all-natural approach, check out our homemade wood floor cleaner, which features castile soap. These measures will go a way to make preserve your wood floor’s shine. You may still want to repeat the polishing process a few times annually, as needed, but don’t exceed four applications per year.